After a cold night in Bollon we set off early for Charleville, riding along the tar for 50km before we turning onto the the dirt. This was our first real decent stretch of dirt road for trip, it was mostly hard pack clay with a bit of sand and not a corrugation to be felt. It had to be the best dirt road I’d ever travelled across and it’d be a stark contrast to what we’d encounter in the days to come. 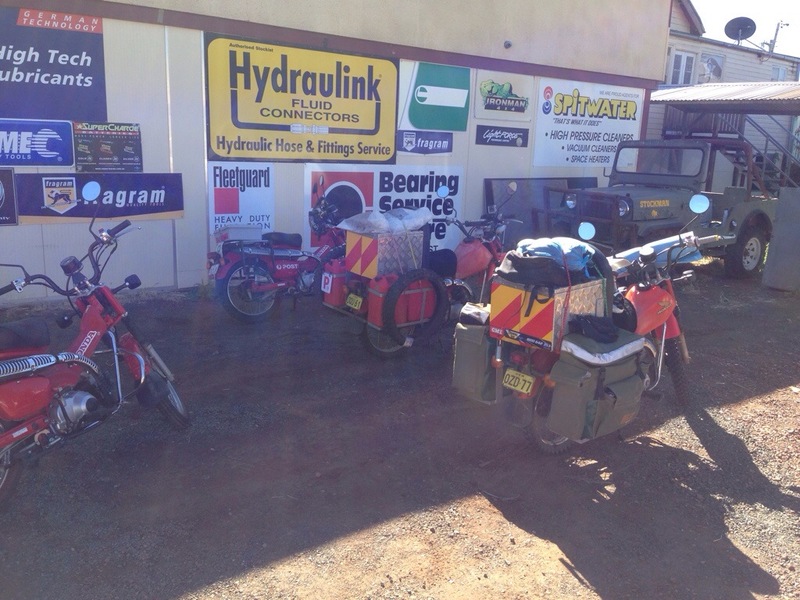 When we arrived in Charleville we went straight to the local bike shop trying to source a set of chain tensioners and axle nut for James Postie. We were able to easily get a set of chain tensioners from the bike shop but ended up replacing the axle nut with a few nyloc nuts from the local spares shop. We pulled into the camping store next trying get a set of thermals but had no luck, fortunately we found some in the store across the road. 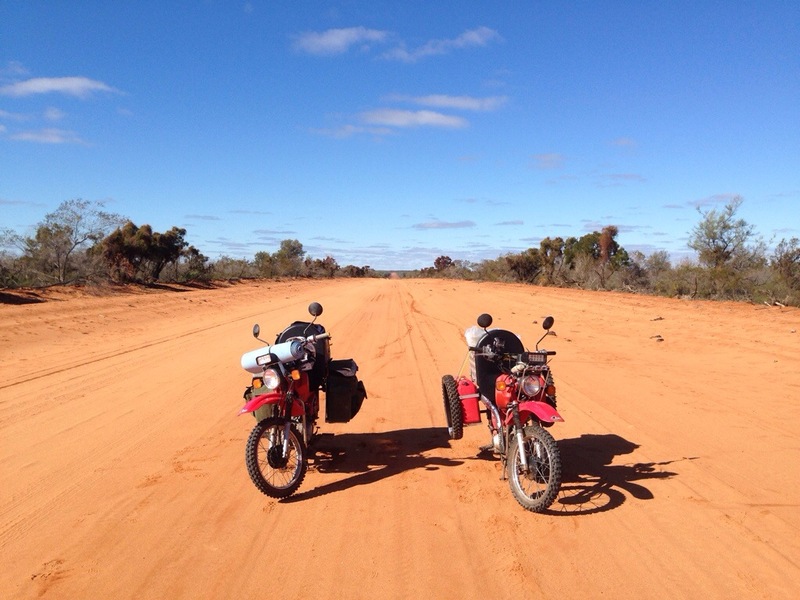 We left Charleville on the tarred Dimentina Development Road (Australia’s longest road) and headed for Quilpie. About 40km out of town I saw some goats with the biggest set of horns I’d ever seen on a goat, I stopped the bike but by the time I got out my camera they’d trotted off into the scrub. However I was able to get some pictures of another mob. 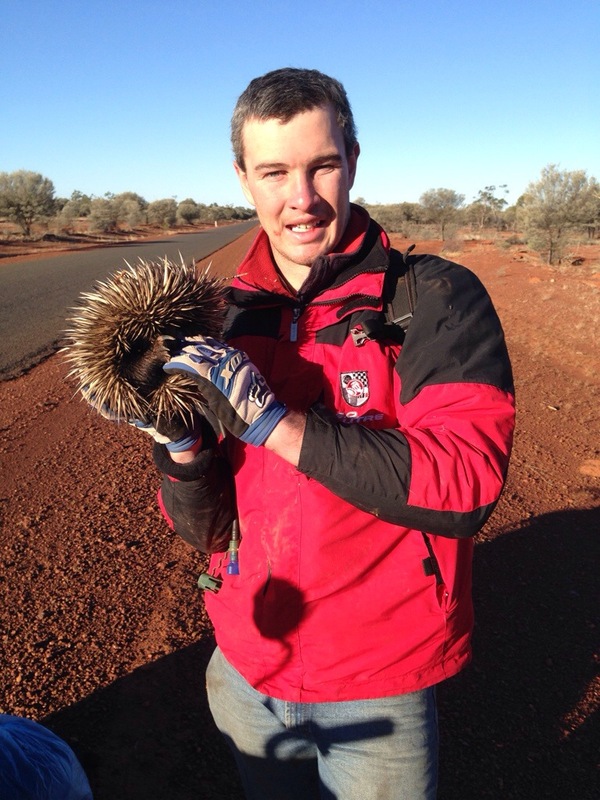 Further along we saw an echidna bunkering down in the middle of the rd so I picked him up and put him down in the scrub, getting a photo along the way of course. We rode onto Qulipie refuelled our bikes and carried on, we only got about 30km out of town before the sun set and we were forced to pull over for the night. 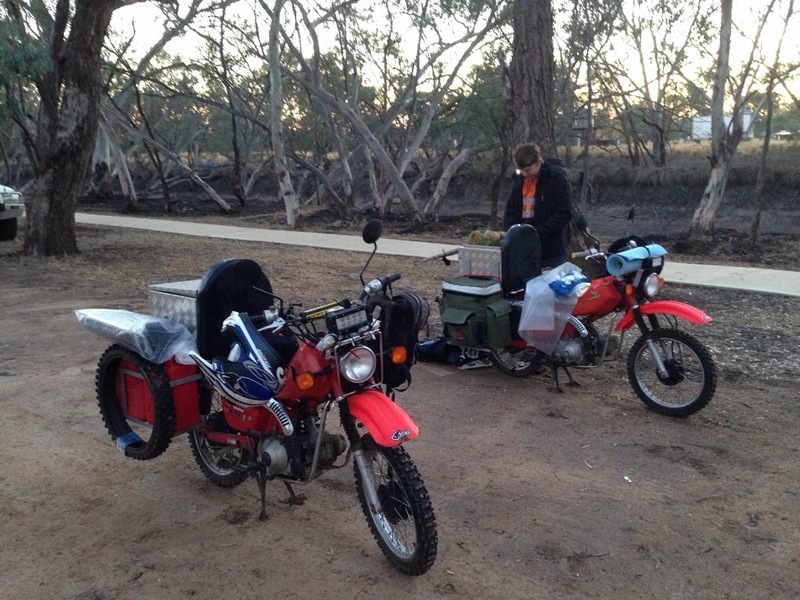 Woken by the sound of a passing car we packed up camp and set off for Windorah. 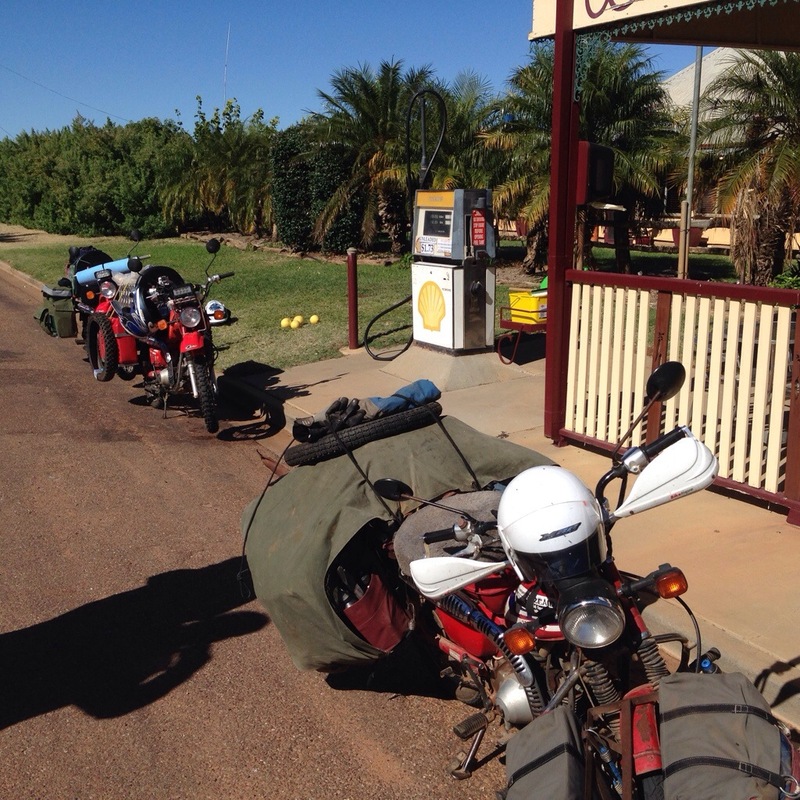 The road was tar and ride uneventful so we reached Windorah by midday and stopped for lunch. After we refuelled we got some pies for lunch and were sitting down outside when we heard the unmistakeable drone of a Postie Bike. 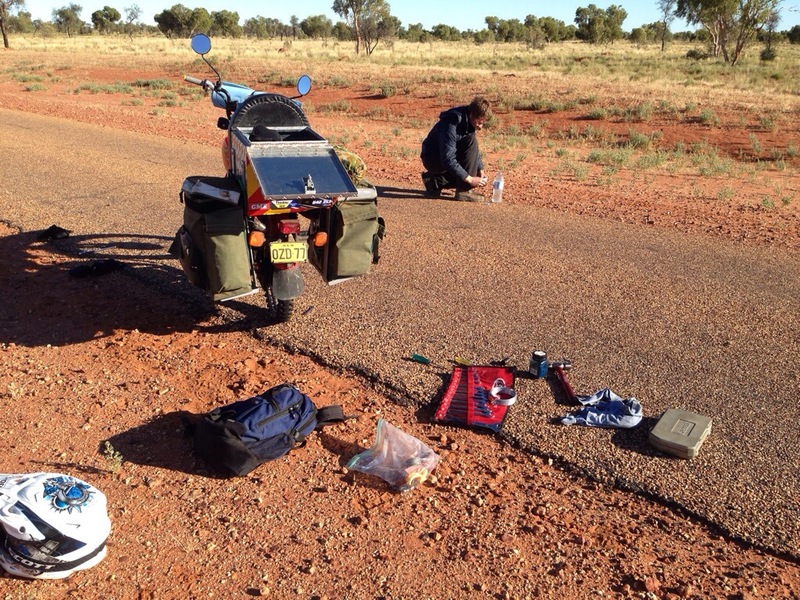 The rider’s name was Pete and he was travelling back to Brisbane from the Gulf. 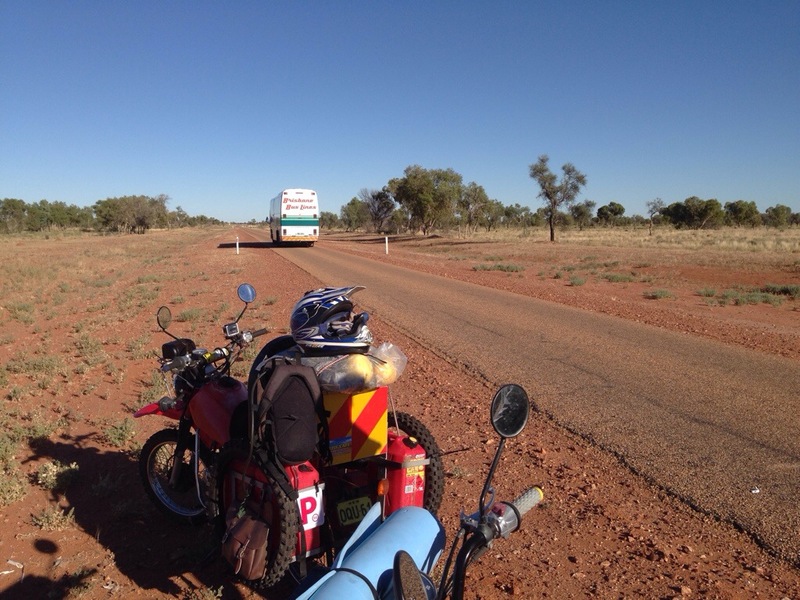 He’d done over 100,000km on his postie in his various travels and was well equipped for solo travel, we swapped information on how we were doing things and then headed our different ways. 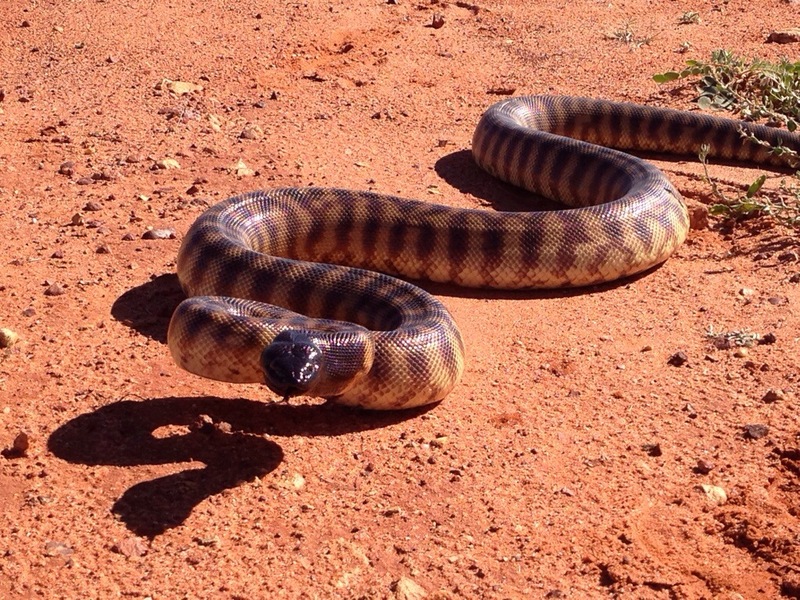 20 km out of Windorah I saw a large Black Headed Rock Python and jumped off the bike to get a picture, being interested in pythons I just couldn’t pass up the opportunity to get a photo with it. However in my rush I knocked the bike over as I got off and and knocked something out of whack in the carbie. I’ve had this trouble before with my CT200, I’m still not sure what causes it but the way to fix it is to strip down the carbie and clean everything out. By the time we fixed this it was getting late so headed back to town and stayed the night. 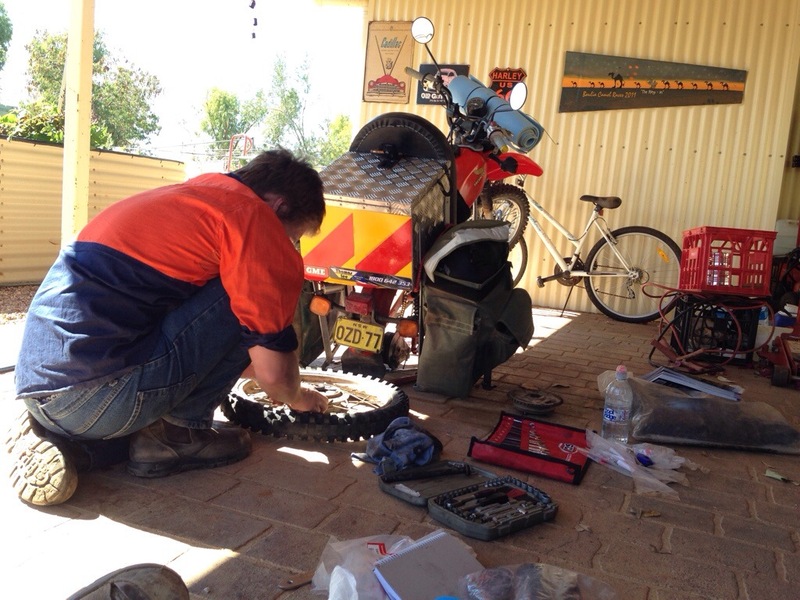 We sent off before Sunrise and got 50km out of town before I had wheel bearing collapse, luckily we carry spares and within a couple of hours we had it fixed. We continued on for Bedourie leaving the tar and heading out onto the dirt. The road was fine until we reached the Barcoo Dimentina Shire boarder and hit 20km of the hardest corrugations i had driven across (the locals in Bedourie assured us it was usually the Barcoo with the rough roads), we were rattled and shaken but managed to find little tracks through them. When we cleared that stretch the road was once again fine and we headed on Bedourie. We stopped in at the Bedourie pub for a quick feed before pressing on into Boulia for origin night, I went with the plain mince pie for lunch although I was very tempted by the camel curry pie. 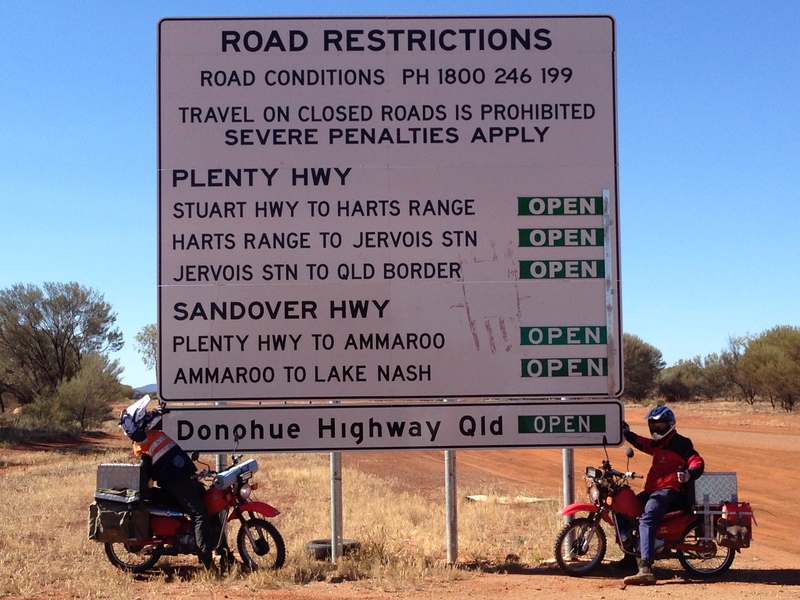 Bedourie to Boulia is all tar with the exception of a short 4km stretch 60km south of Boulia. It was when we reached this section that we stopped to look at the growing wobble in James’ rear wheel and the slight wobble in mine. We soon realised we had broken a lot spokes and decided the best thing to do would be to drop a bit of weight then poke on into town and come back later for the gear. 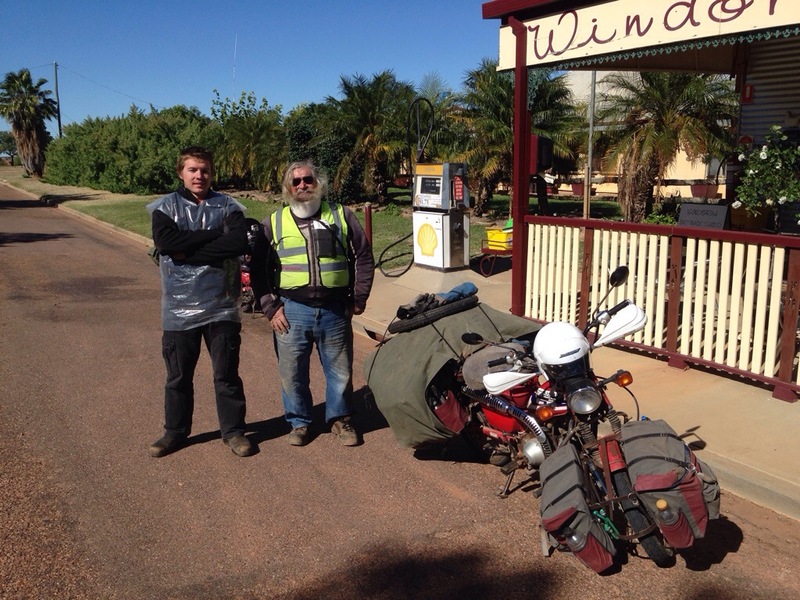 We made it another 5km down the road before we were waved down by Greg and Kev who we’d met the day before in Windorah, we had to them for a while and told them our situation before we pressed on for Boulia. We arrived a half time for state origin and I was straight to the bar cheering on the blues with only the myself and the publican being blues supporters. Today is just a maintenance day with the six broken spokes on my bike replaced and most of the broken spokes on James’ bike replaced. 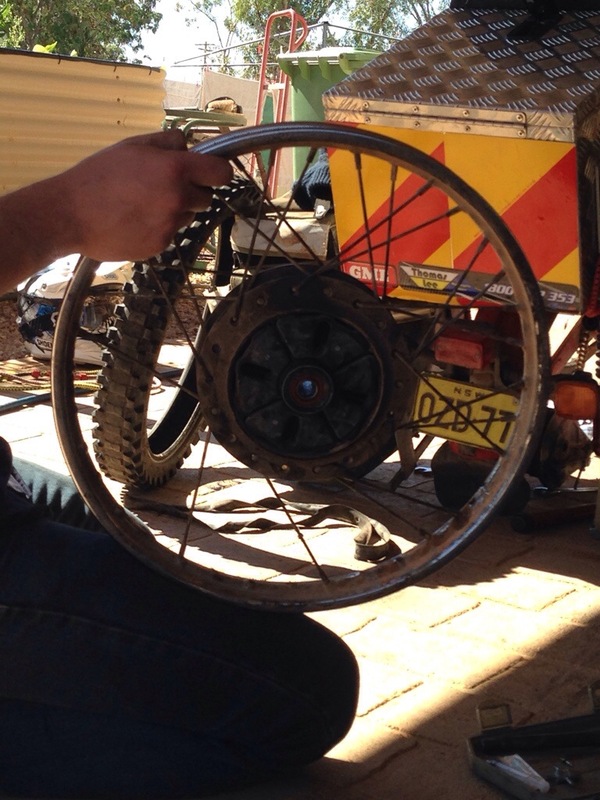 While we didn’t have enough spares for both bikes we’ve been able to source some more along with a complete rim and plan to back on the road to Alice tomorrow. Writing all of this on a IPhone is difficult so I’ll apologise for any (probably many) typos. 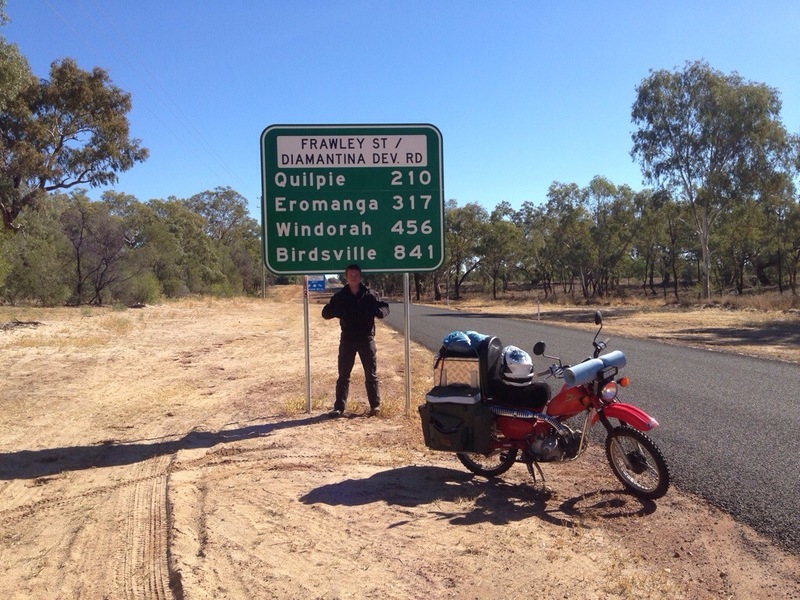 This entry was posted in Uncategorized and tagged Adventure, adventure touring, agriculture, Aussie Helpers, Charity, East to West Postie Ride For Farmers, outback, Postie, Postie Bike, postie riding, touring bike, touring postie, Travel. What an adventure! Keep up the great writing please.